The 2013 SXSW Film Conference and Festival has launched in Austin, Texas, running from March 8 till 16, 2013. Featuring such celebrities on the carpet like: Michelle Monaghan, Jim Carrey, Olivia Wilde, Anna Kendrick, Ashley Bell, Emile Hirsh, Paul Rudd, Fergie, Josh Duhamel, Matthew McConaughey; and The Incredible Burt Wonderstone announced as its opening night film. Also a teaser with the rest of its program revealed, it included the remake of Sam Raimi’s classic Evil Dead, which was not surprising, in a good way. 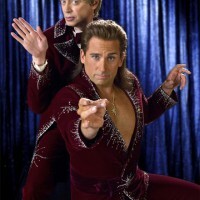 The South by Southwest (SXSW) Film Conference and Festival is thrilled to announce the world premiere of the comedy The Incredible Burt Wonderstone, from Warner Bros. Pictures and New Line Cinema, as the 2013 Opening Night Film. 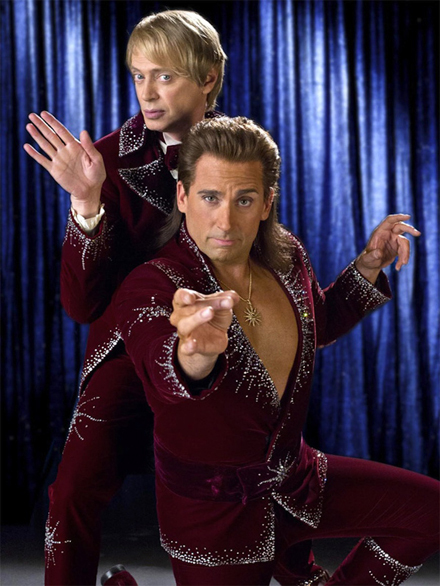 The story follows superstar magicians Burt Wonderstone (Steve Carell) and Anton Marvelton (Steve Buscemi), who have ruled the Las Vegas strip for years, raking in millions with illusions as big as Burt’s growing ego. But lately the duo’s greatest deception is their public friendship, while secretly they’ve grown to loathe each other. Facing cutthroat competition from guerilla street magician Steve Gray (Jim Carrey), whose cult following surges with each outrageous stunt, even their show looks stale. But there’s still a chance Burt and Anton can save the act—both onstage and off—if Burt can get back in touch with what made him love magic in the first place. Directed by Don Scardino, from a screenplay by Jonathan Goldstein & John Francis Daley, and story by Chad Kultgen & Tyler Mitchell and Jonathan Goldstein & John Francis Daley, the film also stars Olivia Wilde, Alan Arkin and James Gandolfini. Produced by Chris Bender, Steve Carell, Jake Weiner and Tyler Mitchell, and executive produced by Diana Pokorny, Vance DeGeneres, Charlie Hartsock, J.C. Spink, Richard Brener, Walter Hamada and Dave Neustadter, the film will be in theaters on March 15, 2013. SXSW also revealed a handful of lively titles that will premiere at the 2013 event, comprised of a range of styles that embody the unique spirit of the SXSW culture. Additional films announced include Joe Swanberg’s welcome return to SXSW with Drinking Buddies, a comedy exploring the blurry line between “friends” and “more than friends,” Downloaded, Alex Winter’s definitive documentary on the rise and fall of Napster, Harmony Korine’s provocative ride Spring Breakers, Evil Dead, the much anticipated remake of the 1981 cult-hit, directed by Fede Alvarez, Ryan White’s doc Good Ol’ Freda, chronicling the never-before-told story of The Beatles’ secretary Freda Kelly, and Everyone’s Going to Die, the first feature from UK directing collective Jones. The complete festival lineup will be announced January 31, excluding Midnighter features, which will be announced with the Shorts lineup on February 6. This year marks the 20th Anniversary of the South by Southwest Film Conference and Festival, March 8 – 16, 2013 in Austin, Texas. Downloaded is a documentary that explores the rise and fall of Napster and the birth of the digital revolution. It’s about the teens that helped start this revolution, and the artists and industries who continue to be impacted by it. •A Conversation with Matthew McConaughey – An in-depth discussion with the incredibly fascinating actor, whose career continues to evolve in exciting and unexpected ways, including his bold choices with recent projects like Magic Mike, Killer Joe, Bernie and Mud. •Humanizing Heroes: Storytelling Beyond Sports – The leading authorities behind some of today’s most notable sports films, Connor Schell (ESPN Films), Ken Rodgers (NFL Films) and Ross Greenburg (Ross Greenburg Productions), discuss the evolution of storytelling in sports filmmaking, its influence on pop culture and its continued resonance across all cultures and backgrounds. •Bates Motel: Story to Screen with Carlton Cuse – In a Special Event combining the SXSW Film Festival and Conference in one, attendees will get an exclusive first look at the pilot of Bates Motel, the thrilling new series from A&E. Following the screening, Executive Producer Carlton Cuse (Lost) will sit down with A&E Marketing EVP Guy Slattery for an inside look and Q&A on the process for bringing this contemporary prequel to life. •Jeffrey Tambor’s Acting Workshop – Jeffrey Tambor continues the tradition of his much loved acting and life workshop by returning to SXSW Film 2013. Part one-man show, part seminar, part question and answer and endlessly entertaining, Jeffrey’s hilarious and empowering presentation inspires the viewer to discover the artist within. Additionally, we are pleased to announce Jacob Soboroff, the host of AMC News as well as a host and producer of HuffPost Live, as emcee of the first Fastball Speed Pitches event at the new SXSW Film Startup Alley. This fast-paced event, designed for bootstrapping startups and geared towards SXSW attendees with short attention spans, will offer registrants the opportunity to get their entertainment company in front of the tastemakers and investors at SXSW. With this particular information taken from the official Press Release we’re looking forward to see the celebrities on the red carpet, and we’re starting with Michelle Monaghan who brought a pop of bright color to the premiere of Gus held at the Topfer Theatre at ZACH on Saturday. The actress was joined by her co-star Radha Mitchell and the film’s director Jessie McCormack, at the event. Olivia Wilde hit the red carpet as well. They came to the premiere of her film Drinking Buddies held at the Paramount Theater during the Film Festival the same day. She showed up in her stripes dress while attending the event and was joined by Jim Carrey. Scarlett Jonahsson’s directorial debut – f-ng bad!